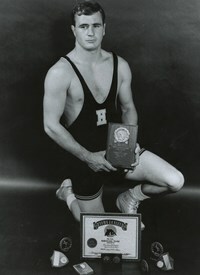 Marty Willigan, Hofstra’s first two-time All-American (1968 and 1969) in wrestling, was a two-time NCAA qualifier and a two-time conference champion. Marty also was the first recipient of the MAC Tournament Outstanding Wrestler Award in 1968. He placed fourth at the NCAA Championships in 1968 and second in 1969, losing to Dan Gable in the finals. In 1968 Marty became Hofstra’s first All-American as he placed fourth at 137 pounds. In addition, Marty was a Metropolitan Intercollegiate champion and was the Metro Championship Most Outstanding Wrestler. In 1969 Marty won another conference championship and advanced to the finals of the NCAA Championship at 137 before falling to Gable. The loss was Marty’s only blemish on the season after 44 wins. After graduating from Hofstra in 1969, he was a member of the USA Wrestling Team at the World Games for the Deaf that year in Belgrade, Yugoslavia, and again in 1973 in Malmo, Sweden, and won a gold medal each time. Following his retirement from active competition, Marty turned his attention to coaching and was a member of the coaching staff for the American wrestling teams in the 1977, 1981, 1985 and 1993 World Games for the Deaf. During the 1989 Games, he coached the Canadian wrestling team. Marty began working at Gallaudet University in 1969 and began coaching their wrestling team in 1970. Marty also served as head coach of the Model Secondary School for the Deaf from 1980 to 1985. He worked at Gallaudet University for 34 years and in 2000 was inducted into the NCAA Division III Hall of Fame for his coaching contributions. Marty is also a member of the USA Deaf Sports Federation Hall of Fame. Indiana Maryland Model Washington D.C.
Model Fremont Maryland Washington D.C.